In keeping with May being Arkansas Heritage Month, today’s Architeaser features a detail of the south portico on the Old State House. The Old State House Museum is the oldest standing state capitol building west of the Mississippi River. Construction on the building began in 1833 and was declared complete in 1842. The building was commissioned by Territorial Governor John Pope, who selected Kentucky architect Gideon Shryock (who previously designed the Kentucky state capitol building) to create plans for the Arkansas capitol. Shryock chose the Greek Revival style, then a popular design for public buildings, for Arkansas’s new capitol. The original plans were grand and too expensive for the young territory’s finances. Consequently, the plans were changed by George Weigart, Shryock’s assistant, who oversaw construction at the Little Rock site. In 1885, the building was renovated and expanded. The south facade and portico were rebuilt. 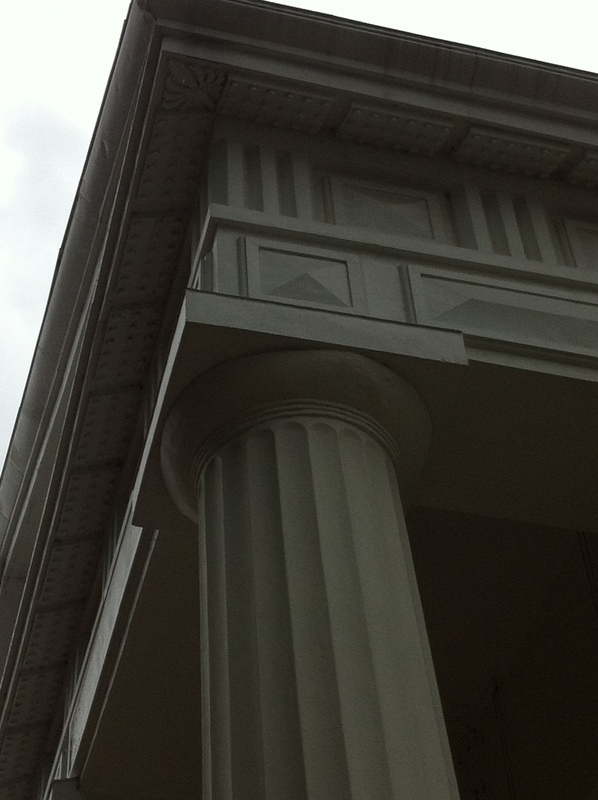 It is this rebuilt portico which is featured on today’s Architeaser. Former Little Rock Mayor John Wassell was responsible for overseeing much of the renovation and built the winding wooden staircases now find inside the building. This entry was posted in Architecture, History, Museum and tagged Arkansas Heritage Month, John Wassell, Old State House Museum by Scott. Bookmark the permalink.